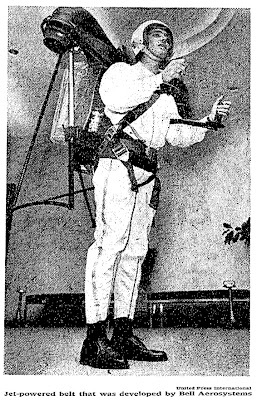 The New York Times article from 1968 titled, "Jet Flying Belt is Devised to Carry Man for Miles," describes the device pictured above as a Buck Rogers flying belt. Oh, how close to the future New York Times readers must have felt on June 28, 1968. Little did they realize that jetpacks would be relegated to the paleo-future. "....the police might use the belts for riot control, for setting up roadblocks in a hurry, for inspecting rooftops for snipers, burglars or others escaping from the scene of a crime."